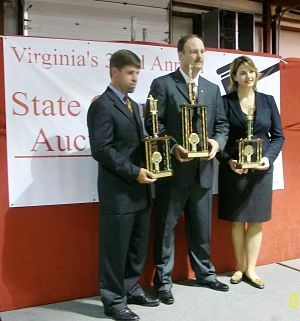 Sherry takes 3rd at the Virginia Auctioneer Championship contest! 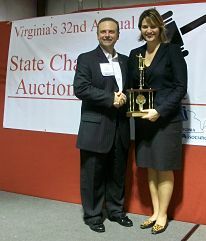 You are here: Home / Auctioneers / Sherry takes 3rd at the Virginia Auctioneer Championship contest! During the day are continuing education classes. 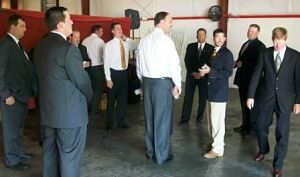 I was the first speaker of the day, teaching the class of ~65 auctioneers how they can set up their own benefit auction businesses. In the early evening — when summer heat is at its worst — we make our way over to N&W Salvage Auction Warehouse where auctioneer George Daniels hosts the Virginia State Champion Auctioneer contest at his sheet metaled warehouse facility. George has a nice BBQ catered into the facility, and all of his regular customers get to enjoy the free meal and the auction competition. Some state competitions separate the men and women into different divisions, but Virginia doesn’t have enough female competitors to make that worthwhile so all competitors compete in one division. This year, there were 18 of us. We each sell three items. Some of the 18 competitors wait backstage in unbearable August heat. The five judges score us on six categories: appearance, bid calling, microphone ability, salesmanship, auctioneer skills, and whether they would hire us to work for them. Six finalists are chosen and sequestered. This year, we were all put into a truck … an air conditioned truck, thankfully! … behind the warehouse. One-by-one, we are escorted out of the truck and brought to the stage. We are asked a question about the auction industry (we don’t know the question in advance), and then sell three more items for final scoring. This year, I took home the third place trophy! Congratulations goes to the 1st runner up, Ben DeBruhl (an auto auctioneer) and the winner, W.O. “Dubby” Isgett, Jr (also an auto auctioneer). Dubby will serve as the 2009-2010 Virginia State Champion Auctioneer. Dubby has the dubious privilege of having placed as 1st runner-up in this competition for the last six years. When someone so consistently performs … always finishing in the top six (and as 1st runner up, no less) with different sets of judges each year … clearly he has a special spark that will win at some point. It was only a matter of time, and this year he took home the big trophy. I like to participate in these, but it’s a balance of time and cost. I’m glad I had a chance to do so this year and get some feedback on ways to improve.